Did you know… according to a recent Deloitte Millennial Survey, two in three millennials in employment want to leave where they work by 2020. So, what if there was a way to prevent these issues from getting worse? 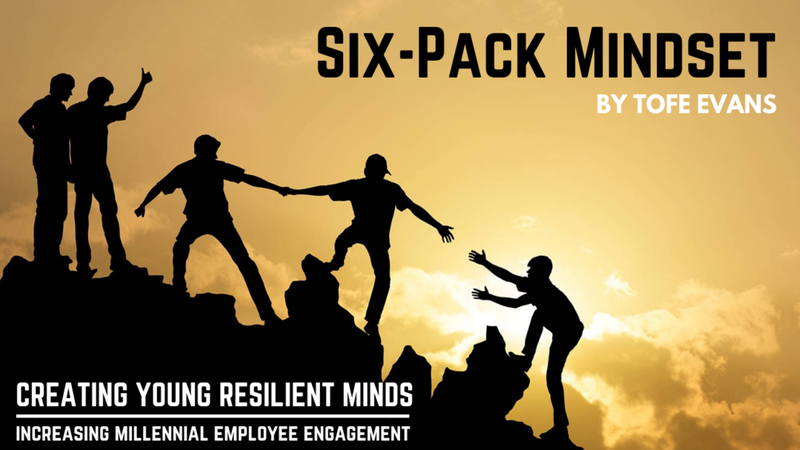 A tool that can bridge the gap, per se that your young employees would benefit from a thought-leader who Inc. Magazine featured in its top 10 picks to read this summer? The next step is a Six-Pack Mind(set)! A 12-week extensive program with Tofe designed to train these minds with a next level of learning to take the learning to a practical, accountable and deliverable level, especially in the workplace. All of which address the following that are scientifically proven to reduce stress and keep them engaged! Physical Movement; Human Connection; Mindfulness & Mindset Practice; Purpose. HOW THIS CAN HELP YOUR TEAM? …speaks your language, then your next step is a Six-Pack Mindset! Q: How is this different from any other online program? Q: What happens after the 12-week program? A: You'll be able to continue using the mindset platform for another 40 weeks (9-months) FREE of charge to continue striving, holding yourself accountable and tracking your progress! Q: How do I know this is value for money? A: Remember, it's not the price you pay, it's the value it brings and what you choose to do with it. Enrolling in this course alone will not bring you results. It is the actions you take and the accountability the online platform brings that will get you results. You may purchase a coffee a day and it's gone in 10 minutes. Through this program and platform, not only do you get years of trialled experience, but access to the platform for another 9 months (1 year total). Much cheaper than a coffee day! Now, that's value for money. A: Maybe your mindset is not where you'd like it when you are challenged by fear. Or you're waking up feeling run down and unhealthy. Or you're living everyday with no purpose attending unfulfilling work. If any of these point resonate, then this is for you. Q: Can Tofe personally coach me 1-on-1? A: You will be coached online through the program to give you all the support you need to achieve your goals. Tofe’s time is limited but if you would like to investigate working directly with Tofe, please fill out the form here.